Ready To Combat Your Candida From The Inside Out? Our Digital Cookbook is here to help! Is your candida taking over your life? Are you tired of digestive problems, hormone imbalances, mental fog, chronic sinus issues, fatigue, achy joints, and unnecessary weight gain? If so, we are here to help! We have tons of experience working with and cooking for clients with Candida overgrowth. Here we’ve put together our most popular, flavorful, and healthy recipes in this comprehensive e-cookbook to help you beat your candida and look and feel your best! 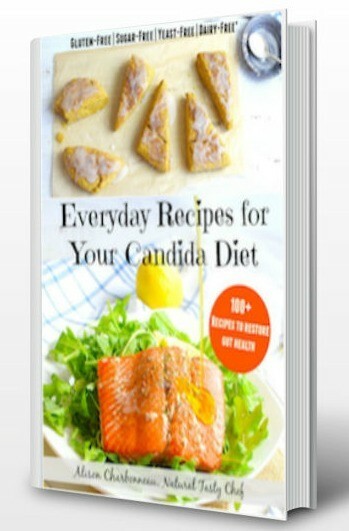 AND, the recipes are so delicious; you won’t even realize that you’re on a candida-fighting “diet”! Are we making you hungry?!? Over 100 recipes including beverages, breakfast dishes, entrées, salads, soups, side dishes, desserts, breads, dressings and dips! This e-book downloads as a PDF for you to print out or store on your computer or other devices. Once downloaded, for your convenience, all recipes within the Table of Contents are linked to bring you straight to that recipe within the ebook. Also compatible with iBooks so you can have it with you at all times! – Your device may require apps such as iBooks or Adobe Reader. – If you lose your copy please refer back to the email you received when purchased as this will have a download button. If you no longer have this email, email me with the date of purchase and your PayPal receipt as proof. – This product is 258 MB. If the download fails please ensure you have an internet connection, sufficient storage space on your device for the file and then restart your computer or laptop and try downloading again.